Trader Joe's is a go! The plan to put a Trader Joe's store at 1630 Washington Road in Upper St. Clair has received township approval. The build-out of the store may not be completed before year's end but it's a promising addition to the retail corridor adjacent to Mt. Lebanon. California-based Trader Joe's currently operates one store in the Pittsburgh area, in East Liberty. The Pittsburgh Post-Gazette just ran an eight-part series titled "Mapping Mortality" by staff writers David Templeton and Don Hopey (Mr. Hopey is a former resident of Mt. Lebanon). In it, they addressed the higher-than-national-average mortality rates that prevail in Pittsburgh and southwestern Pennsylvania believed to accrue from the incidence of air pollution linked to coal-fired power plants and other industrial companies labeled by the EPA as major sources of pollution. While the news for southwestern Pennsylvania is not good, a silver lining may be that "several municipalities with mortality rates less than the national average suggest a smaller polution burden along with socioeconomic factors that reduce disease risk. These include Mt. Lebanon with a rate 10 percent below the national rate and Upper St. Clair, whose mortality rates are 32 percent below national rates...South Fayette in western Allegheny County is 28 [percent] under the national average." The flip side? Close-by communities Bridgeville, Heidelberg and Carnegie have a combined mortality rate that is 36 percent above the national average and lung cancer rates in Heidelberg are an astonishing 140 percent higher than the national average. A summary of this informative series can be found on the P-G's Staff Blogs. The Emmaus Community of Pittsburgh is currently seeking a group of creative, motivated individuals between the ages of 22 and 40 to serve on our new Young Professional Advisory Board. We are excited to be partnering with American Eagle to launch this new project! The purpose of the Young Professional Advisory Board will be to develop deeper relationships between Emmaus and Pittsburgh’s young professional community and to work together with Emmaus staff, Board, and residents to support the Emmaus mission. If you are looking for a way to dedicate some time and effort to helping others while meeting new people and expanding your network, we believe this will be a great fit! We seek individuals who want to share their skills and expertise in a collaborative setting. Potential opportunities include: helping to grow the Emmaus young professional network and increasing awareness of our mission; supporting Emmaus programs, special events, and fundraising efforts; engaging in volunteer activities with our residents; and finding innovative, fun ways to partner in order to further our mission. We hope that members will become involved in the areas most suitable to their skills, passions and lifestyles. Interested in learning more? Contact Tiffany at 412-381-0277 or e-mail tmerrimanpreston@emmauspgh.org. The gifts of time and energy are among the most valuable. Please consider helping the Emmaus Community. Post-Gazette restaurant critic China Millman has kind words for Rich and Melanie Westerfield, owners of Aldo Coffee on Washington Road, in today's paper. Rich is now roasting and selling his own beans as opposed to carrying those of highly-regarded (and far-off) roasters Intelligentsia (Chicago) and Stumptown (Portland, Oregon). Here's raising a cup(pa joe) to their continued success! 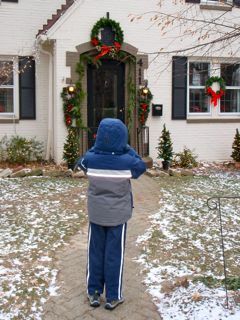 Junior shutterbug "SGL" was at it again and doubled the size of the "Holiday Doorways" slide show on the blog's right sidebar. Take a peek at the bounty of Mt. Lebanon during this holiday season. All thanks to friends and neighbors who collectively make Mt. Lebanon such a beautiful place throughout the year. From our friends at Mt. Lebanon Magazine, a holiday pictorial that reminds us of the many reasons we choose to live here. How can you not love a town with its own Halloween Parade, brewfest and UltraParty? Count me in! Have you ever wondered how our municipality runs? is it The Little Engine That Could or a bureaucracy rife with red tape? Get a taste of civic government in action at tonight's Regular Meeting of the Mt. Lebanon Commission, scheduled for Monday, December 13 at 8 p.m. in the Commission chambers at 710 Washington Road. Among the items up for discussion are the 2011 municipal budget. View the full agenda here. Citizen comments are welcomed at the beginning of all Commission meetings.